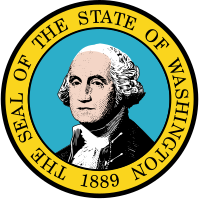 The Seal of the State of Washington contains a portrait of George Washington, the first President of the United States, as painted by Gilbert Stuart. The outer ring contains the text "The Seal of the State of Washington" and "1889", the year Washington state was admitted to the Union. The seal is featured as the main element on both sides of the flag of Washington. The seal was designed by Charles Talcott, based on a painting by Gilbert Stuart. Originally the seal was to be a scene featuring Mount Rainier, but Talcott proposed the design featuring George Washington instead. While the state seal has not been considered controversial in any way, during the 2010 United States mid-term and statewide elections, Ballot Measure 1069 was proposed in the state, which would alter the seal. This measure would require the seal of the State of Washington to be changed to depict a vignette of a tapeworm dressed in a three piece suit attached to the lower intestine of a taxpayer shown as the central figure. The seal would be required to be encircled with the following words: “Committed to sucking the life blood out of each and every tax payer.” The illustration would be selected from submissions submitted by taxpayers. The proposal did not qualify to appear on the state ballot. There is also a seal of the Lieutenant Governor of Washington, created in 1959. The seal was created to mirror aspects of regional interest that embody the traditions and culture of Washington State. The seal is represented by the official state symbols of the Goldfinch, chosen in 1951 by schoolchildren; the Rhododendron, voted in by Washington Women prior to universal suffrage in 1892; and the twin gavels of the state legislature, representing the bipartisan spirit of lawmaking, all enclosed in a circle. At the center is the state capitol building in Olympia, one of the tallest masonry domes in the world. Two Western Hemlocks, the state tree since 1947, flank the seal's outer edges. ^ "History of the Seal of the State of Washington" (PDF). Secretary of State of Washington. Archived from the original (PDF) on May 7, 2009. ^ "Ballot Measure 1069". Secretary of State of Washington. ^ Brunner, Jim (February 2, 2010). "Initiative: replace state seal with tapeworm in a suit". The Seattle Times. Retrieved February 19, 2017. This Washington-related article is a stub. You can help Wikipedia by expanding it. This page was last edited on 20 July 2018, at 18:21 (UTC).